Kids of all ages love having tea parties and we’ve put together this awesome list of the best childrens tea sets to help you find one that’s just right for your child! Any one of these delightful kids tea sets is sure to thrill your child, and because we know boys love tea parties too, you’ll also find some tea sets that your son will love playing with. Whether your child invites their dolls, stuffed animals, other family members or friends to their tea parties, we’ve got something for everyone. And for that touch of class that older kids will enjoy, we’ve also included some lovely porcelain tea sets. The Fisher-Price Laugh & Learn Say Please Tea Set is an absolutely adorable tea set that offers your child 3 different modes of age-appropriate play! Including 2 tea cups, a shape sorting cookie tray and 3 teethable cookies, this fun tea pot has different songs that introduce numbers, shapes, manners, opposites and greetings. As with all Fisher Price Laugh & Learn toys, there are 3 Smart Stages levels and each level offers age-appropriate learning: Level 1 is the Explore stage and includes early learning words and sounds. Ideal for babies 6+ months. Level 2 is the Encourage stage which has questions and simple directions for your little one. This level is great for 12+ months. Finally, level 3 is the Pretend play stage and this level is great for imaginative play and fun role playing for your toddler. Perfect for 18+ months. The teapot itself is designed to make some fun sounds and your child can get the songs to play by pressing the tea bag. This Fisher Price tea set requires 2 AA batteries (not include) and is a wonderful way to introduce your little one to the world of pretend play. Ideal for kids 6 months to 3 years old, this is the perfect first tea set for girls and boys. Kids think this Fisher Price tea set is lots of fun and really cute! This awesome VTech Learn And Discover Pretty Party Playset gives your toddler hours of learning entertainment! It consists of a pretty serving tray, a cheerful lemonade pitcher that has pretend lemonade inside, 2 colorful cups and 4 cute little desserts. Your child will be able to enjoy over 70 sounds and phrases that teach them shapes, colors, sharing and so much more. Plus there are 6 cute sing-along songs for your child to learn and enjoy. When your toddler puts the pitcher onto the tray, both the pitcher and tray light up and they’ll hear fun, happy sounds, phrases and songs. Each of the pretend treats are a different shape and fit into their own little space on the serving tray which helps your child learn how to match up the shape of objects. This VTech childrens tea set also has 2 volume options – regular and loud, and an on/off switch. To clean it, simply wipe off the pitcher and tray; the rest can be hand washed using soap and water. This charming Pretty Party Playset is ideal for any two year old who wants to throw their own little party, complete with snacks and lemonade. It’s a wonderful interactive toy that makes a lovely gift for any toddler on your shopping list. Designed for children 6 months to 3 years old, this VTech Playset requires 2 AA batteries (included) and has high and low volume levels. Kids love all the lights, sounds, songs, melodies and phrases! Your toddler will have tons of learning fun with this adorable LeapFrog Musical Rainbow Tea Set! This delightful tea set has 10 pieces in all and provides hours of tea time fun with lots for your toddler to see, hear and do. The enchanting set includes a colorful teapot, 2 pretty cups and 6 pieces of cake on a plate. It also has 2 volume options: high and low. With the flick of a switch on the side of the tea pot, the magic begins! The tummy of the tea pot lights up in 6 different rotating colors and your child will be treated to a bubbling sounds, along with an invitation to a tea party. Pressing the cute heart-shaped button on the front of the tea pot starts one of 7 lively songs and at the end of the song there’s even a cool whistling sound just like you’d hear with a real stove-top kettle! After each song, the tea pot will light up and tell your little one what flavor of tea they’re serving. Each time your toddler presses the heart-shaped tea time button, the color changes and the tea pot matches the color to a different flavor. It’s a really great way for your child to learn how to match the colors to the flavors! Tipping the tea part activates a fun pouring sound and this charming little tea pot even lets your little one know when it’s time to brew another pot of tea. By lifting the interactive lid of the tea pot, your child can hear fun noises and phrases, something that younger kids really enjoy. 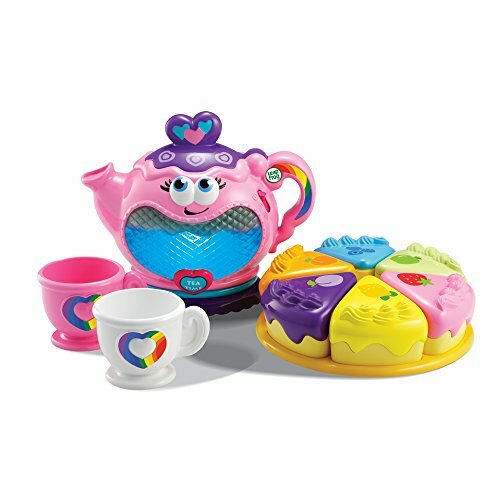 There are also 6 pretend pieces of cake, each one a different color and each one designed to match the 6 rainbow colors and tea flavors of this charming Musical Tea Set. To keep this tea party set clean, all you have to do is wipe down the tea pot and the rest can be hand washed with soap and water. This tea party set for toddlers can be enjoyed by both girls and boys and is ideal for children between the ages of 1 and 3 years. Kids love all that they can see, hear and do with this musical tea set! Kids love the sound the tea pot makes when they’re pouring tea! There’s just something magical about a garden tea party regardless of your age. This wonderful Melissa And Doug Sunny Patch Bella Butterfly Tea Set will allow your toddler to feel the magic of garden tea party whether they’re inside or outside! This cute little 17 piece butterfly tea set is done in pastel pink, green and yellow and consists of a teapot with lid, a sugar bowl with lid, a cream pitcher, 4 cups, 4 saucers, and 4 spoons. The tea pot holds a full cup of liquid and each of the cups hold about 3 ounces, making it the perfect size for toddlers to handle. 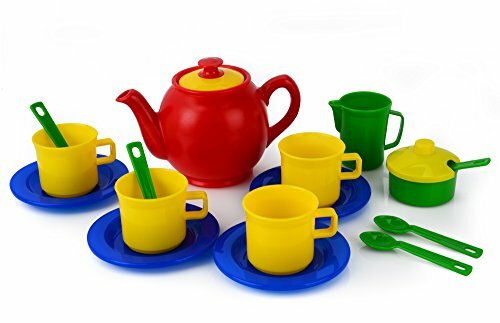 One of the best things about this toy tea set is that is food safe and BPA and PVC free so it can be used with real food. 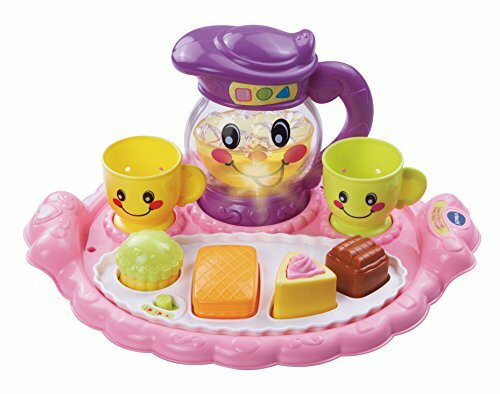 Recommended for ages 3 and up, this tea set is fun to use with friends, dolls, stuffed animals or having tea parties with parents or siblings. Your toddler will have a great time serving those miniature sandwiches or cookies, tea or juice and they’ll love being able to host their own little party. If you’re looking for a cute and functional tea set for your toddler, this butterfly tea set is well worth considering. 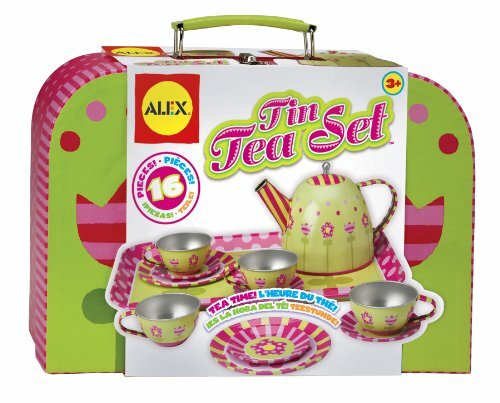 Toddler tea parties aren’t just fun for girls, boys sometimes enjoy them as well and this Alex Toys Tin Tea Set is suitable for both girls and boys! 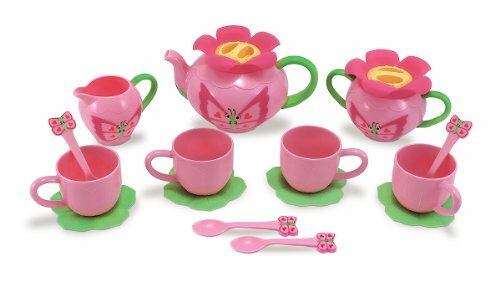 Yes, this toddler tea set does have flowers, but it is not overly feminine and the colors of green, pink, and white as well as the overall pattern of the set makes it appealing to boys as well as girls. This lovely little tea party set consists of a tea pot with lid, 4 cups, 4 saucers, 4 plates, a serving tray and a cardboard carrying case. It’s extremely durable and can be used for serving real treats, but because it’s made of metal, you won’t want to serve hot food or liquids using this set. Kids tea sets are perfect for either indoor or outdoor tea parties and this tin tea set is no exception. It’s easy to clean and doesn’t break or even dent easily when it’s dropped. These dishes are quite small: The plates are 3″ in diameter, the saucers are about 1 ½” in diameter and the cups are about 1″ in diameter. One grandparent stated that the tea cup holds just over 1 tablespoon of liquid. Although the carrying case for this tea set is cardboard, it’s well made and has slots so that everything can be put away neatly. Recommended for kids 3 years and up, this Alex Toys tea set is ideal for any toddler who love having tea parties with parents, siblings, stuffed animals or dolls. This tea set is fun for children to play with! If you have an older child who enjoys tea parties, the Schylling Children’s Tea Set is an ideal tea party set for them! 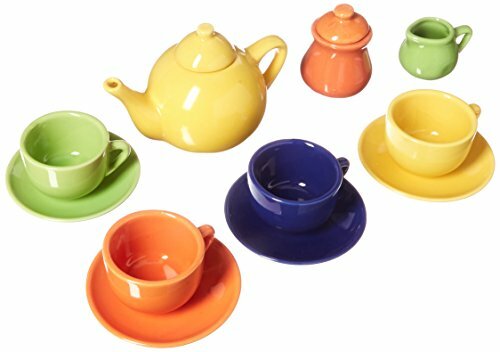 This kids porcelain tea set is very colorful and consists of 4 cups, 4 saucers, a tea pot with lid, sugar bowl with lid and creamer. Each of the cups in this set are a different color and the teapot, creamer, and sugar bowl are also a different color from each other. Some parents report that the cups in this tea set holds about 2 or three ounces of liquid and the teapot holds enough liquid to fill all 4 cups. Because this set is made of porcelain, the recommended age is 8 years and up. However, many parents find that it’s also suitable for children as young as 3 or 4, as long as they’re careful with it or supervised when using it. While some parents use this porcelain tea set for special occasion tea parties, other parents use it as a tool to teach their child how to take care of more delicate objects. If you’re looking for a tea set to make tea time for your child more sophisticated and elegant, this Schylling tea party set is definitely worth checking out. If you’re looking for a durable tea set that will last your child for at least a couple of years, the colorful and cheery Kidzlane Play Tea Set is well worth considering! This great little plastic tea set comes with 15 pieces, including a tea pot and lid, a sugar bowl with a lid, a creamer, 4 cups, 4 saucers, and 4 spoons. This cute little tea set is a very nice size with the cups measuring about 3″ high and 2″ in diameter. The teapot is about 6.5″ high, 4″ in diameter and holds enough liquid to fill all 4 cups. 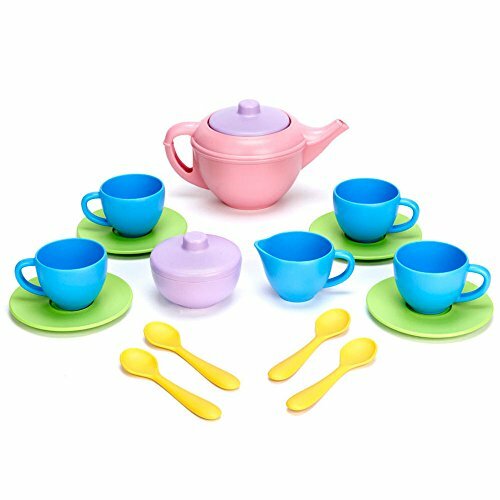 Parents like that this tea set doesn’t have any type of design making it perfect for little boys as well as girls and they really like the fact that this tea set is easy to clean since it is dishwasher safe. Tea parties are great way to teach children lessons in saying please and thank-you. They also help your child learn how to properly pour liquid and serve guests, and your child will love using this set for all their indoor and outdoor tea parties. 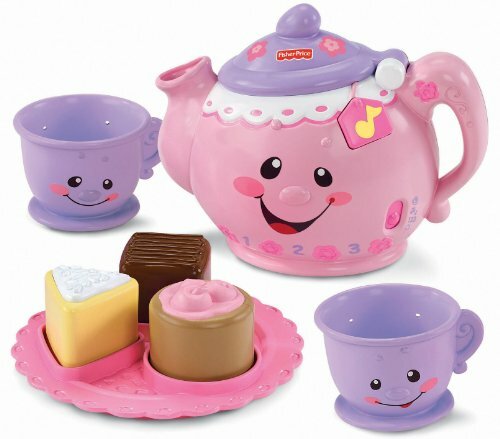 Designed for children age 3 and up, this delightful tea party set is BPA free and perfect for toddlers of either gender. It makes a wonderful gift for any occasion! This tea set provides hours of fun play! 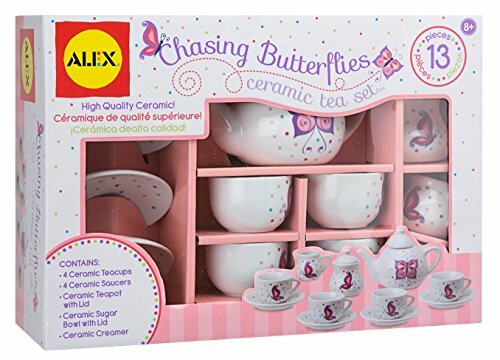 This elegant Alex Toys Chasing Butterflies Ceramic Tea Set is a wonderful way to introduce your child to high tea! Ideal for older kids, this tea party set features 4 cups, 4 saucers, a tea pot with lid, sugar bowl with lid, and creamer. The ceramic is fairly thick and the lovely purple and pink butterflies with dots it a delicate look. The cups in this tea set are quite small as they are only 1 ½”tall, but a great size for your child to hold and pour her ‘tea’. While this tea set is recommended for children ages 8 years and up because it’s made of ceramic, many parents find it suitable for kids as young as 4. One parent uses this tea set as a reward for their child completely their chores for a set period of time. Others use it for tea parties with grandparents, or to teach their child how to care for more delicate objects. The perfect tea set for those dress up or more elegant tea parties and is well loved by the children to whom it is gifted. It’s an idea set for kids who enjoy tea parties and are able to take care of their toys. Kids of all ages have hours of fun with this tea party set! This cute Green Toys Tea Set allows your child to engage in imaginative play while helping to save the environment Made from recycled milk jugs, it’s BPA free and made to FDA food standards. The 17 pieces are pastel in color and dishwasher safe. Ideal for toddlers who are 2 and up. Need to know more? Read our full detailed Green Toys Tea Set to see if this might be the perfect gift for your child. This Schylling Summer Bugs Tin Tea Set allows your child to enjoy nature while engaging to imaginative play with their dolls, stuffed animals, friends, and family. Featuring 15 pieces in total, it’s designed for kids 3 years old and up. Want to learn more? Read our full detailed Schylling Summer Bugs Tin Tea Set and see if this lovely tea party set would be perfect for your child! A fun book about childrens tea parties is a great way to get your toddler excited about having their own tea party. The books we’ve chosen talk about how wonderful it is to have a tea party, including who to invite (even a dinosaur makes the invitation list), decorations, what to serve and lots more. Any one of these books is a perfect compliment to any of the wonderful childrens tea sets on our list! This Fancy Nancy: Tea For Two story is sure to become a favorite of any child who enjoy tea parties! 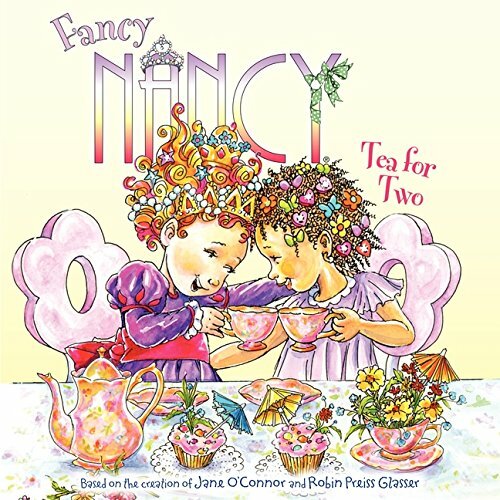 Written for children ages 3 through 8, this 24-page book tells the story of Fancy Nancy and her friend Bree who get together for a tea party. But when an argument breaks out between the two friends, will they work out their problems or will the tea party be spoiled? Small children like this book because arguing with their friends from time to time is something they can relate to. And they find it interesting to listen or read about how these two friends work through their small spat. They also enjoy discovering ways to set up a tea party. Parents like the fact that this book is easy for their young child to relate to without being too babyish. They also like that it introduces their child to new words and really captures their interest and imagination. This award winning book will make a great companion gift to go with a tea set for your child for their birthday, Christmas or any special occasion. An ideal book for any young child who loves tea parties, Tea For Two is a great addition to any young child’s library. 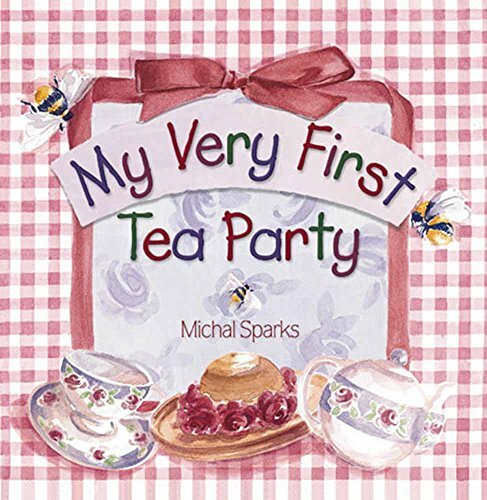 This cute My Very First Tea Party by Michal Sparks is a fun and exciting way of introducing your little one to the wonderful world of tea parties! This delightful board book uses cheerful rhyming and lovely pictures to tell the story of Mrs. Honey Bee Five’s tea party. The fun details include how she sets the table, brews the tea, and more. Sturdy enough for your 1 to 3 year old to look at over and over, this book is a simple story about how enjoyable it is for friends to get together and have tea. Perfect for encouraging imaginative play, this introduction to tea parties makes a great birthday or Christmas present. And when you add an age appropriate childrens tea set to the gift, you’ll open a whole world of imagination and pretend play fun for your little one! Several parents have actually themed birthday parties around this book for their one, two or three year old. They host a fancy dress up tea party complete with little sandwiches, cookies and tea, they read the book during the party, and then they present the book to the birthday child. Some parents even gave a copy to each of the guests. On a more personal note, my grand-niece who is 8 years old, still holds tea parties and reads this book to her stuffed animals and dolls, just like her mother read to her when she was younger. A great addition to your toddlers library, My Very First Tea Party is sure to create an interest in reading for any small child. 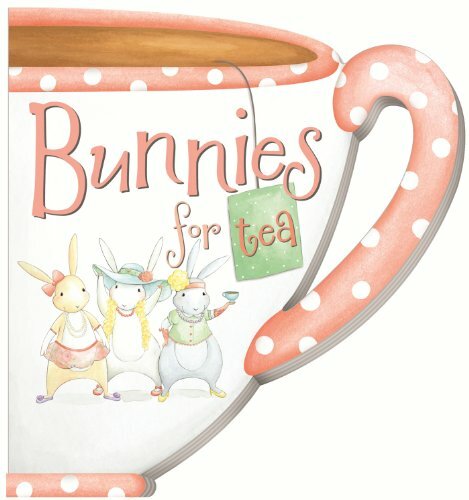 Shaped like a teacup with soft pastel illustrations and playful rhyming text, Bunnies for Tea is sure to be a crowd pleaser for toddlers and beginner readers! The board book version of this 10 page books holds up well to little hands as your child relives the bunnies tea time adventure again and again. The teacup handle on this book makes it very easy for small children to carry around. And when your child opens their book they have two handles to hold onto, making it easier to grip when they’re looking at the their board book or reading the story. Parents like the cheerful rhymes in this book, and the cute little story this book tells. Kids think it’s funny when one of the bunnies falls into a tea cup and they love the adorable illustrations that accompany this story. This book pairs well with any of our lovely childrens tea sets. And if you add a hat, a boa, and a cheap necklace from the dollar store, your child will be all set for their very own tea party adventure with friends, family members, stuffed animals or dolls. If you’re looking for a great birthday, Christmas or Easter gift, Bunnies for Tea is sure to be a huge hit when added to your child’s library. Kids love listening to it and reading it! 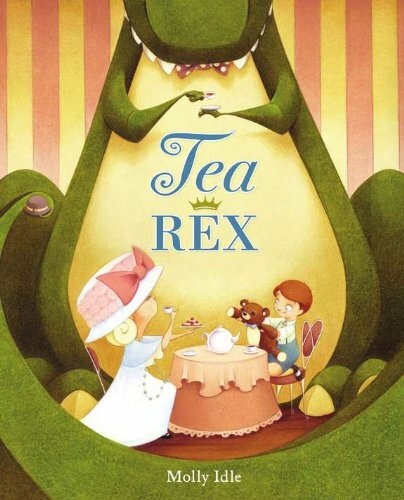 Tea Rex is a delightful tongue in cheek book written especially for preschool and kindergarten kids! This 40 page book is about a little girl who invites a very unusual friend to tea. The text of this story is written in a prim and proper style, while the illustrations that accompany the text shows the exact opposite. The author’s words and illustrations tell the story of how a gracious hostess manages to accept all her guest’s mistakes and make him happy and comfortable, despite his less that mannerly behavior. This book is sure to become well loved by both girls and boys whether they love tea parties, dinosaurs, or just a good story. The mixture of tea party and dinosaur makes this a gender neutral book, which many parents really like. Parents also like the fact that this book gently encourages children to accept those that are different and teaches a few manners and rules for good behavior. Give your child this book and a stuffed dinosaur and watch them create their own imaginative tea parties with their new prehistoric pal. Perfect for any child’s library, Tea Rex is wonderful and humorous book that’s sure to fill both your child and you with laughter! Let’s Have A Tea Party! is a delightful book designed for children ages 6 years and up. This 32 page book is both entertaining and informative and it’s a wonderful way to help your child learn the basics about entertaining. Not only is the book fun to read, but it also explains how to throw 6 different types of tea parties, including a garden tea party and a tea party with grandmother. The book includes instructions on making sandwiches for tea, and what type of other foods and drinks can be served. It even has a few recipes to help get your child started. It also discusses making and sending out invitations, creating decorations for the party, and fun activities to do. And one of the unique aspects of this book is that parents find it as handy when throwing a tea party for their children as kids do when throwing their own tea parties. Let’s Have a Tea Party is a great first ‘how to’ book for little girls, taking them step by step through the basics of throwing a tea party. It also does a wonderful job of encouraging your child to use their imagination to create their own unique, themed parties. Kids think it’s lots of fun to read! Tea Party Rules is a delightful book tells the whimsical story of a young bear cub, a stuffed animal, a little girl, and a tea party. When taking a walk in the woods one day, a little bear cub smells something appetizing. Following his nose he discovers another bear and some cookies. After begging the other bear for a cookie he discovers the other bear is not real, but a stuffed animal. He’s just about ready to grab a cookie for himself when a little girl pops out of a house. The tea party hostess! Thinking the little girl will give him a cookie, the little bear cub soon learns that this hostess has certain rules that he must follow before he can have his much wanted treat. What does the little bear cub have to do in order to get the cookie? Will he actually get the treat in the end? Although amusing and entertaining, this story also covers important things like how to deal with frustration, compromising, and following rules to get a much desired reward. 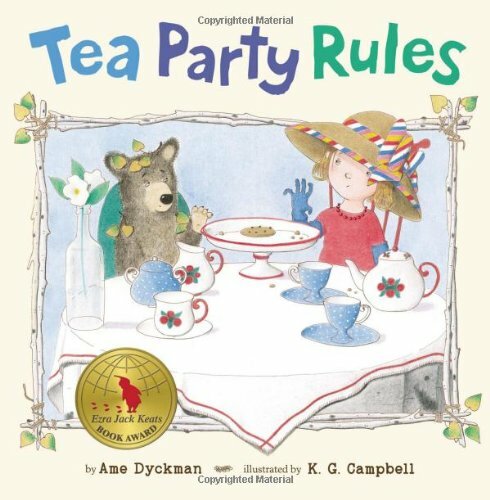 Tea Party Rules will appeal to both girls and boys, as most children find they can relate to both the bear (who wants instant gratification) and the little girl (who is bossy). Ideal for preschool and kindergarten age kids, this book makes a great gift for any little girl or boy, especially those who love tea parties or cookies. Your child is sure to find the story funny and want to read it over and over and over again! Kids love the fun story! 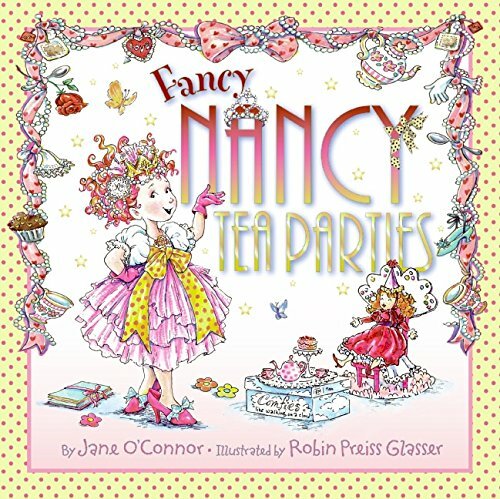 Fancy Nancy: Tea Parties is a cute little ‘how to’ book based on the Fancy Nancy character than many little girls know and love. This 40 page book is filled with all types of wonderful tips about how to make a tea party more elegant and fun. It covers all sorts of different topics such as what to wear at a tea party, what kind of treats to serve, how to make decorations, types of tea parties kids can enjoy, and lots more. In addition to all that, this Fancy Nancy book also talks a bit about manners and teaches some of the basics about how to entertain. Little girls who have enjoyed other Fancy Nancy books will be thrilled to have another story involving this colorful and lovable character. And if your child hasn’t been introduced to Fancy Nancy yet, she’s in for a real treat! 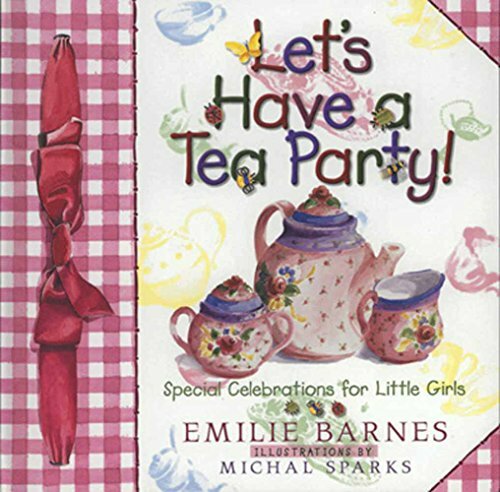 Designed for preschoolers through to early elementary age children, this book about tea parties is designed to inspire your little girl to engage in imaginative play while learning some basic information about entertaining. It makes a great gift when combined with any one of the childrens tea sets on our list. And if you throw in a hat and pair of gloves, your child will have everything they need for their very own fun tea party with friends, dolls, stuffed animals, or family members. Kids think it’s fun to read!